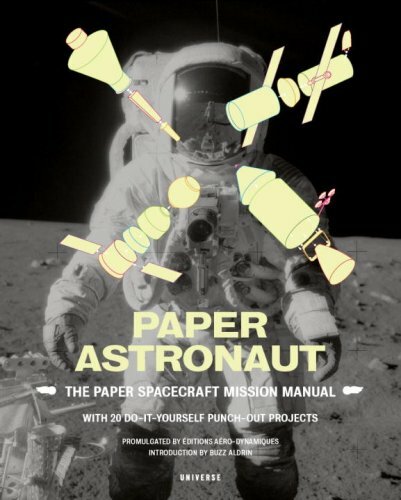 From the creator of Paper Pilot and Paper Captain, Paper Astronaut is a beautifully illustrated voyage into deep space, combining stunning archival photographs and colorful technical drawings with expertly designed die-cut models that readers can actually cut out and assemble. Published for the fortieth anniversary of the moon landing in 1969—and introduced by Buzz Aldrin—the book includes histories of twenty feats of aeronautic engineering drawn from half a century of space programs around the world, from Apollo 11 to the Soviet space station Mir and China’s Shenzou 7 capsule, and featuring the most iconic designs of fifty years of space exploration. Each spacecraft is accompanied by amazing stories, fascinating facts and statistics about the universe around them, and mesmerizing photographs of the vessels in space. Sixty-four pages of the book are devoted to finely crafted die-cut paper models of the featured rockets, presented with clear instructions for assembly and helpful advice for deploying your galactic fleet.